For sociologist Elfie Miklautz, objects are important for understanding the world. She writes: “Communal reality is produced and judged with the help of products. They contribute to the construction of an ordered, comprehensible world and offer orientation”(1). the organization of objects themselves. My essay provides various historical examples from German design. As a product designer, my focus is on product design. We will begin by travelling through time to the United States at the beginning of the 20th century, because it is there that modern product design gets its start. In 1880, the Americans Frederick Winslow Taylor and Lillian and Fred Bunker Gilbreth conducted separate studies of factory operations. They found that unnecessary movements and badly arranged tools caused unnecessary strain on the worker thus resulting in inefficient production. They argued that tools should never cause injuries, workers should be well trained and the organization of work should be planned better. Although Frederick Taylor first published his “Principles of Economic Organization” in 1911, his theses and the investigations of the Gilbreths were already known at the turn of the century. Businessman Henry Ford was also aware of the studies by Taylor and the Gilbreths when he began his work constructing the automobile at the beginning of the 20thcentury. Representing a break from prior practice, the automobile was not intended exclusively for the wealthy. Instead, his vehicle was to be produced as a mass automobile for everyone (2). The Ford Motor Company, established in 1903, wanted its first finished product to be low-priced and outfitted with a sufficiently powerful motor. The material was to be of suitable quality and hardiness so that America’s car could survive, as long as possible, the roads of the day, which were as a rule still quite rough. 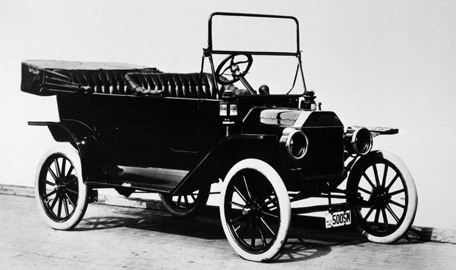 In 1909, Ford produced the first version of the “Model T” without a roof or side panels. It had two forward gears and one reverse gear. Ford’s development was an immediate sensation. The original “Model T” was soon joined by convertible and sedan versions and even a spacious touring car. “Lizzy,” as the “Model T” was also known, was extremely popular. In order to satisfy exploding demand, Ford drew on Taylor’s research and in 1913 introduced the assembly line, at first only in targeted areas and then throughout the wider business. Up to that point, groups of workers had assembled the car in one area. Now, the individual parts passed by workers on the line and were assembled piece by piece. The entire production process was now be subjected to the desire for stagnation-free circulation. Effectively, the assembly line represented an enormous uptick in productivity. At the same time, the sale price could be lowered ever further. Together with more efficient production methods, the standardization and high manufacturing accuracy of the materials were further preconditions for Ford’s mass production. Without the established, normalized measurements of the tools and machines and a consistent quality of material, there could be no guarantee that the constituent parts, which were often produced separately, would fit together. As a result, they could also be exchanged for replacement parts at a later date. This principle survives to this day. Henry Ford understood that customer desires could be fulfilled with relatively little effort by establishing just a few product types (convertible, sedan, etc.) varying only in single elements. It took decades, however, for the principles of streamlining, normalization, standardization and categorization to become common property of production technology. Still today, there are elements of this trend requiring a great deal of refinement. Nevertheless, following Henry Ford, product designers now have to include the production processes within the companies for which they work in their plans and sketches. We will return to Ford’s assembly line later, but first, I would like to discuss the world’s first example of a unified corporate design. Between 1907 and 1914, Peter Behrens, a German autodidact, completed his efforts to give AEG, then an electrical company in its infancy, a unified image and appearance. He redesigned the entire product range and also designed factory buildings and showrooms. Not only was Behrens’s accomplishment in design impressive, but also his analytic and organizational work as well. AEG was founded in 1883 by Emil Rathenau and was originally named the German Edison-Society (Deutsche Edison-Gesellschaft). Four years later, in 1887, the company’s name became “General Electricity-Society” (Allgemeine Elektrizitäts-Gesellschaft or AEG). By the end of the 19th century, the fledgling electrical industry was booming. AEG provided pioneering work in the area of alternating current transmission systems; it expanded and soon produced many types of electrotechnical investment and consumer goods, such as light bulbs, home appliances, street lighting, trams and turbines for power plants. Though these technologies and the organization of production are impressive, design was a completely separate issue. 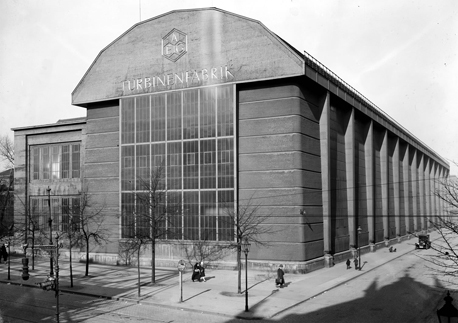 Founder Emil Rathenau recognized this and invited Peter Behrens to Berlin in 1907. Within seven years, Behrens reinvented the entire product range, designed catalogs, advertisements and new company buildings. He modernized obsolete forms by creating a new, unadorned design. He slimmed down the product range and streamlined individual equipment component parts. Behrens thought in building blocks or components, that is, interchangeable forms, materials and surfaces. AEG managed to achieve a modern aesthetic and not only for isolated products, but for everything. The modernity of technology and modes of production were to be expressed through a design that was correspondingly advanced. This advanced design was then in turn supposed to reverberate back to the company. Through Behrens’s systematic and modern aesthetic, AEG achieved a significant image advantage over its competition. Despite new products, the latter’s products suddenly came off as dated and retrograde. Following this digression into corporate design, let us now take up Taylor’s assembly line once again. Around 1880, Frederick W. Taylor and Lillian and Fred Bunker Gilbreth, working in the USA independently of one another, explored factory work and thus paved the way for both the mechanized assembly line and contract work. In the 1920s, the Viennese architect Grete Schütte-Lihotzky applied this principle to the residential sphere. She understood living and cooking as a production process operating within the division of labor. Her so-called “Frankfurt kitchen” was organized like a factory workplace in which various task sequences were arranged efficiently. These innovations brought Schütte-Lihotzky world renown. 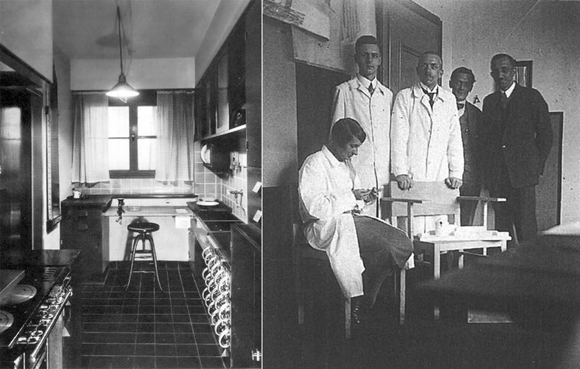 As described in American studies on operational economics, the Viennese architect created work areas oriented along the walls of the kitchen. The floor space of the room measured no more than 6.65 square meters. The kitchen table disappeared. The then newly developed gas oven arrived and saved space. Every corner was used for specific functions in a specific order. Consider, for example, dishwashing: “take from the left, wash on the right, deposit to the left.” Schütte-Lihotzky’s kitchen organization was well thought-out down to minute details. There were easily cleanable work surfaces, a space-saving swivel chair, an unfolding ironing board and an oak drawer intended for protecting bread from worm infestation. Everything was covered in whites and blues, intended to come off as hygienic. The blues were also supposed to deter flies. To this day, in Germany Schütte-Lihotzky’s elaborate kitchen unit workplaces have remained the model for built-in kitchens in public housing. Similar to Grete Schütte-Lihotzky, numerous artists, designers and architects in Germany around 1920 cultivated a zeal for machines. Industry stood for progress and many saw the machine as a possibility for providing the lower classes with affordable goods. An example of this phenomenon is the still legendary Bauhaus, established in Weimar in 1919. As was the case with Ford, its focus was on production for mass demand. Around 1922, teachers and students at the Bauhaus experimented in the ceramic workshop, which had traditionally been oriented towards handcrafts, with possibilities for efficient production, e.g. in modular design. Individual components were to be combined in various ways in order to achieve a wealth of variants with only a few parts. Examples of this can be found in the work of Theodor Bogler and Marianne Brandt (3). Bogler visited the “Velten-Vordmann” earthenware factories near Berlin in 1923 and became acquainted there with the industrialized ceramic production process. He was inspired to create what is probably his most famous design series: the various models of his combination teapot. Bogler dissected the archetype of the teapot down to its constituent elements: body, opening, spout and handle. He reduced them to basic stereometric forms. Then, for a “manufactured mass molding,” (4) he systemically went through all the various combinational possibilities of the created components. All elements were not rotated on a wheel as had previously been the norm at Bauhaus, but were instead individually molded and then, in a further step, assembled in various combinations. Thus, with only a few basic elements, numerous teapot variations were created. Bauhaus teacher Marianne Brandt in turn applied this component concept to numerous projects, namely to pitchers and lights. coasters could also be used as lids, salad bowls could double as sugar bowls or soup bowls. Roericht’s design thereby simplified the organization of food service, the operation of which had previously been quite time consuming. Up to this point, we have seen examples of the organization of families and systems of products. The textbook examples for the organization of various functions within the product emerged at the same time, namely, the electrical appliances of Braun AG. 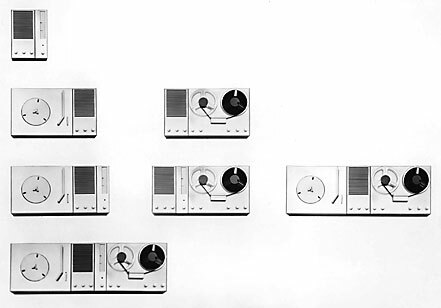 Dieter Rams, the factory designer for Braun, was heavily influenced by the ideas of the Ulm School of Design, notably by the ideas in product systems, categorization, modular designs and system design. As in Ulm, Rams understood function and beauty as measurable quantities. That which could be mathematically defined and clearly outlined and arranged counted as beautiful by default (per se). Rams reduced his drafts to the absolute necessities like the students and teachers of the Ulm School of Design. He also made use of the methodology developed in Ulm of focusing on the presentation of a problem and not, at least at first, on how the product was to look. Ulm’s methodology also comprised methods of analysis and the logical justification of design solutions. The radio is divided into two symmetrical halves. On one side is the speaker “trellis” and on the other the controls and dial. The speaker openings on the left are made up of thin parallel beam openings. There are cut in such a way that their overall form results in a circle. A strip in the middle serves to stabilize the opening. The radio’s dials and controls are on the right side of the front. They are arranged at right angles to one another and are made up of rows of knobs of various sizes that follow a clear operational hierarchy. The streamlining of the industrial production process through standardized components or modules for product systems has had a long tradition in Germany. The simplification of components still continues to be perfected today. An example of this is GIRA, a producer of electrical installation systems. Founded in 1905, GIRA at first produced toggle switches and safeguarding elements. 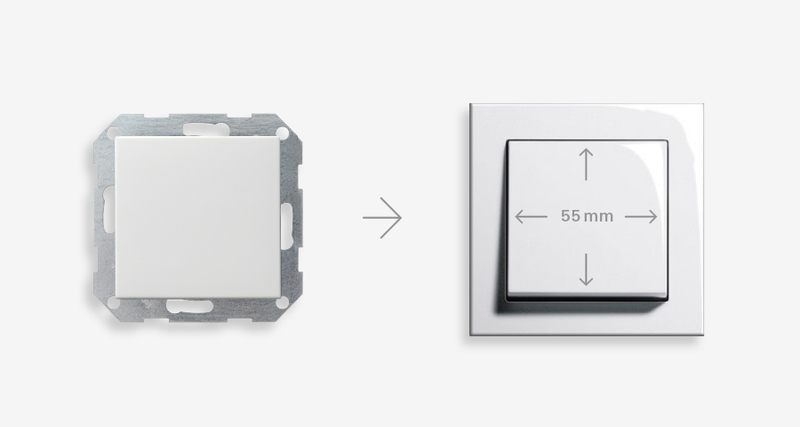 Today, GIRA’s offerings range far beyond simple light switches and grounded electrical sockets. With the advent of image transmission, microelectronics has made it possible to know who is standing outside the front door. With a smartphone, one can access home technology while in transit. In 1998, the company revised its product offerings along the lines of consistent system design. The goal behind this was both, to save costs for storage and logistics as well as to be able to offer a large selection of products. The individual apparatuses each consist of an interior part and a covering. The interior disappears in conventional concealed junction boxes and the covering can be combined with various frames. They can be disposed of in single-stream recycling systems. GIRA concentrates on only a few product programs that are integrated into product systems. The company refers to this system design as the platform strategy. Similar to current automobile construction, various program variants can be subsumed under a single basic platform. GIRA’s “System 55,” newly introduced in 1998, served as a platform for four distinctly designed switch programs with its more than 180 different central elements in a choice of three colors. These switch lines are called “Standard 55,” “E2,” “Event” and “Esprit.” The selection ranges from grounded electrical sockets as well as integrated childproofing and telephone connections to concealed radios. The four program lines are available in diverse material and color variations. In total, GIRA has produced several thousand different products that can be freely combined through the “System 55” operational system, together with “Standard 55,” “E2,” “Event” and “Esprit.” In this way, a huge number of aesthetic solutions is made possible by organizing and combining only a few standardized components. If the context is changed at a later day, for example out of issues of taste, the corresponding frames and covers are easily exchangeable. In comparison, non-compatible model-series would demand more machines, more logistical expenditure and also more storage space than would an intelligent platform or system structure. In 1995, GIRA developed a new generation of switches concurrently with a new switch assembly line. The number of switch components was reduced yet further, so that it now functioned even more efficiently. The principle of variant reduction is driven ever forward. Currently, GIRA is aiming to offer various materials for its frames in order to achieve a larger selection with the same design and the same components. Thus there are frames made of linoleum, shale, glass and concrete. >>> Download this Article (PDF)! (1) Elfie Miklautz: Die Produktwelt als symbolische Form. In: König, Gudrun M. (Hg. ): Alltagsdinge. Erkundungen der materiellen Kultur. Tübinger Vereinigung für Volkskunde, Tübingen 2005, S. 43. (2) Adrian Forty: Objects of Desire. Design and Society since 1750. New York 1992, S.122f. (3) Klaus Weber (Hg.) 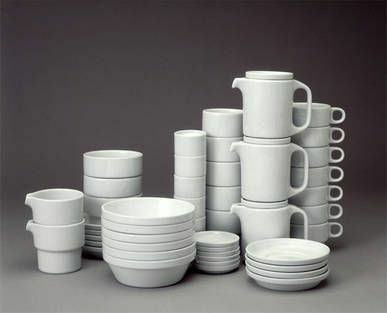 für das Bauhaus-Archiv: Keramik und Bauhaus. Berlin 1989, S. 60. Volker Albus, Reyer Kras, Jonathan M. Woodham (Hg. ): Design! Das 20. Jahrhundert. München, London, New York o.J. Herbert Lindinger (Hg. ): ulm… Die Moral der Gegenstände. Berlin 1991, 2. Aufl. 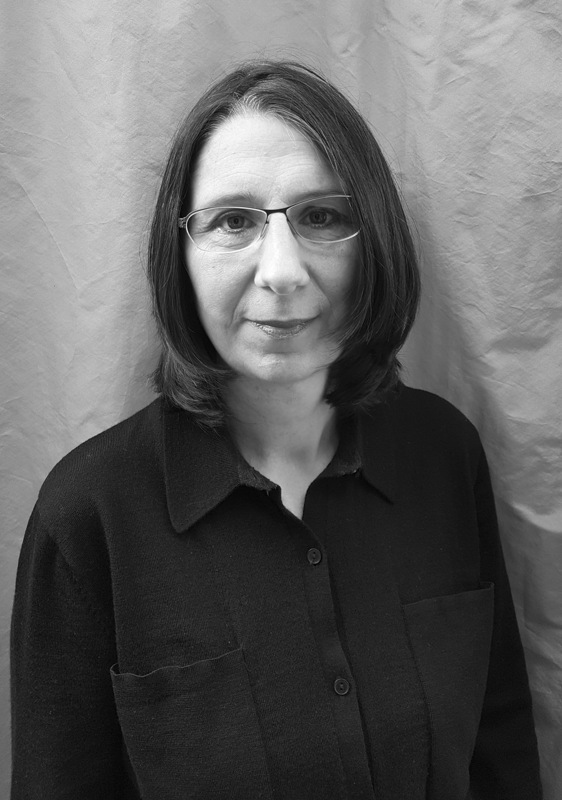 * Prof. Dr. Marion Godau, is a german Design Historian and a Professor for Design-, Culture- and Art History at the University of Applied Sciences Potsdam (FHP). She joined the DESIGNABILITES Family in 2016. This entry was posted in Design History, design research and tagged bauhaus, design, designgeschichte, designhistory, deutsches design, Dieter Rams, Frankfurter Küche, german design, herbert lindinger, hfg ulm, history, Margarete Schütte-Lihotzky, marianne brandt, Marion Godau, nick roericht, organisation, organization, penny sparke, Peter Behrens. Bookmark the permalink.